When the summer heat finds its way into Las Vegas, there is no escaping the sun’s rays. Even as we enter into night, the temperatures have been known to linger in the valley and heat up the night skies. As the entertainment capital of the world, this doesn’t stop locals from hitting the streets of Downtown Las Vegas and enjoying a night out. One way to combat the heat while on a Downtown Las Vegas bar crawl is to order up some cool, refreshing cocktails at the many establishments that line both sides of Fremont Street. Who says a cocktail has to be extravagant to taste fantastic? Cuba Libres put a refreshing twist (literally) in a classic rum and coke. A citrus twist is added with a splash of lime juice to the classic rum and coke. This simple addition will bring out a whole new flavor to a traditional cocktail. Nothing cools you down quite like a tall mojito. 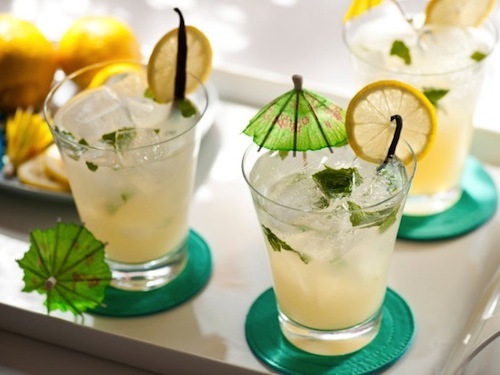 Made with simple syrup, white rum, mint and lime juice, this drink is the perfect go-to on those hot summer bar crawls. Enjoy the traditional style or try it with blackberries or other summer fruits to take it up a notch. Pretend you are on the beaches of Mexico with a tequila sunrise. Made with tequila, orange juice and grenadine, this sweet drink is perfect for sweltering summer nights. If tequila’s not your style, opt for a rum sunset. Made with the same ingredients, swapping out tequila for the rum. Mint Juleps are the penultimate summer cocktail, and the best part is you won’t have to be at the Kentucky Derby to order one. All you need is four ingredients to make this sweet, refreshing cocktail: mint, sugar, water and bourbon. Mint Juleps are the ideal sipping drink while on your Downtown Las Vegas bar crawl. If you are looking to try these cool-down cocktails in Las Vegas, sign on for a bar hop in Downtown Las Vegas like no other. With Vegas Pub Crawler you’ll ride a pimped-out, multi-rider cycle through the streets of downtown to the coolest DTLV bars. Book a pub crawl tour and beat the summer heat.